This is one of the most important aspects of weight loss and long term weight management. To start out, my best advice I can give is to work on a compromise. For example - if you like 2 teaspoons of sugar in your tea, work on cutting back to 1 teaspoon for a week or two then try 1/2 a teaspoon, eventually working down to none. If you usually have two biscuits in an evening, try only having one. It's often hard for people to go cold turkey when it comes to cutting down on sugar so this is a good way to help introduce cutting back without feeling like you are left with nothing. It's a good idea to work on this over a few weeks to a month as your palate adjusts to the taste. There are many psychological reasons why people turn to food in between meals when they may not necessarily be hungry. A good way to help reduce this is to drink a large glass of water and then see how you feel as often thirst is mistaken for hunger! Sometimes just going on a light walk, just getting out of the house can help clear your mind when you feel like reaching to the pantry door. Ensuring you are reaching your recommended daily intake for protein not only helps you build lean muscle, it also helps with satiety levels. Increased protein intake is associated with increased thermogenesis which plays a role in satiety levels, along with a shift in energy expenditure. As protein also assists in the synthesis of lean muscle mass, this can also have a positive effect on metabolism as higher muscle mass percentages are associated with a higher and most efficient metabolic rate. 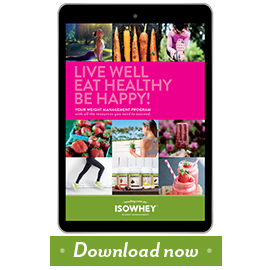 Ensuring all meals have protein present is important and including a good quality, nutritionally balanced protein shake such as IsoWhey is a fantastic addition to any healthy diet or weight loss program. Unhealthy fats are often found in processed and fast food. Replacing these fats with healthy fats such as avocado, nut butters, nuts, seeds and oily fish can have some really positive effects on your health. The consumption of these healthy fats is associated with a decrease in cholesterol levels which in turn reduces your risk for cardiovascular disease. Studies also show that the consumption of healthy fats is also associated with increased satiety levels, which means you will feel fuller for longer. Studies have also shown that a diet which includes healthy fats, is low in sugars/carbohydrates and high in protein is an effective diet for weight loss. It is best to avoid refined carbohydrates such as; refined sugar, white bread, white rice, potato products and other pre-packaged convenience foods. It’s best to choose complex, unrefined carbohydrate foods such as brown rice, rye bread and oats. A good way to manage your diet is to reserve treat food as ‘weekend only’ food. This does not mean you can go crazy on junk food over the weekend; it just means it's OK to enjoy a treat on Saturday night and even a dessert on Sunday night. As long as you are keeping your other meals in check over the weekend; having a treat is totally acceptable. It's just important that if you plan on following this rule; it isn't broken during the week. If you are wanting to start loosing weight and don’t quite know where to start, incorporating a 30-45 minute fast paced walk each day is a fantastic way to start your weight loss journey. Studies show that aerobic exercise, such as walking, plays an important role in fat burning. A 30 minute daily walk is better than no physical activity. Walking also has many other positive effects on the body which contribute to creating a new healthy you! 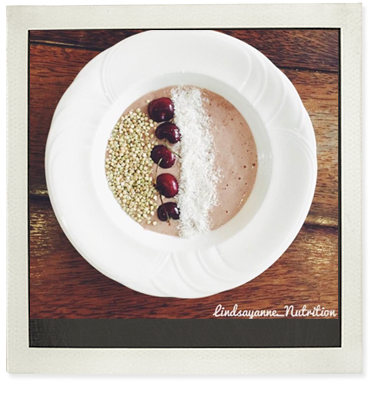 Blend frozen banana, IsoWhey powder, cherries and coconut. Top with buckinis, extra coconut and extra fresh cherries. Lindsay-Anne has been studying in the field of naturopathic and nutritional medicine over the past 3 years. She has a strong interest in weight loss and management along with women's health. Lindsay-Anne has a very strong passion for health and devotes her time to inspiring others. She found that naturopathic medicine resonated with her due to the holistic approach which involves treating that person as a whole, from all aspects. 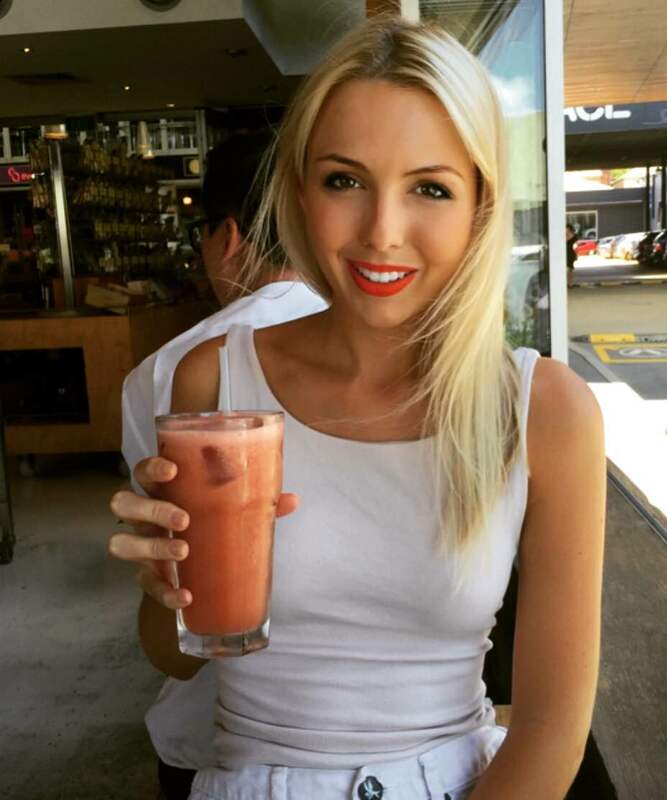 Lindsay-Anne is currently writing a nutritional/lifestyle e-book which is designed to help people lose weight and reach their optimum health and wellbeing; based on naturopathic and nutritional medicine principles. She looks forward to being able to inspire and assist more people in the near future.